These high-quality, low-maintenance chairs are ideal for any gathering both indoor and outdoor. Featuring durable steel frames and solid construction, they'll last for years to come. Coordinate with our resin tables to create your own set. 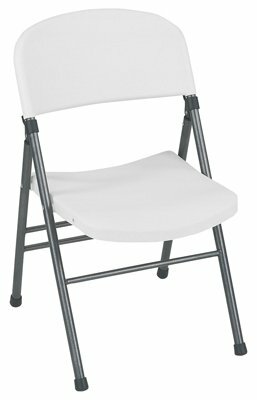 The Commercial Molded Folding Chair saves space and time with its folding frame and lightweight feel. Chairs have a molded resin seat and back. Folds Flat - Folds up tight and compact for easy storage Low Maintenance - Durable steel frame with powder-coated finish Strong - Use of cross braces and tube-in-tube reinforced frame Non-Marring - Leg tips protect floor surfaces For indoor/outdoor use BIFMA commercial rating. Specifications Furniture Type: Seating Mobile: Yes Usage: Indoor.